memorial day skate of wine! This just happened. Skate of Wine. Venice Beach. 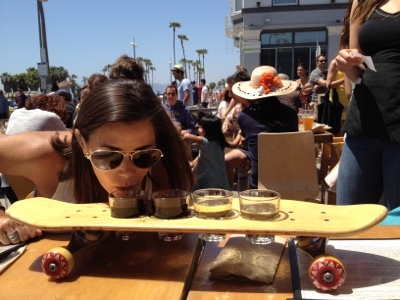 So at Venice Ale House, you get to order samplers of wine and they serve it to you in an environmentally-apropos skateboard. I LOVE skaters and obv I love wine, so this was a slam dunk. They’ll choose the wines for you if you want, but that’s not how grapefriend rolls (pun!). We got Bodega Rancho Viognier, Zocker Gruner Veltliner, Adobe Road Grenache and Haraszhy Zinfandel. Boom. Tags: Grenache, Gruner, viognier, zinfandel. Bookmark the permalink. Previous post ← happy pre-memorial day happy hour!